This is the Sassy Librarian Blouse which is from the Craftsy class of the same name, but I'm calling it the Libby Blouse because apparently I can't spell Librarian when writing on my traced pattern pieces. Thank goodness for spell check! This was the first Craftsy class I bought, I think it was about a year and a half ago. Anyway, it was before I bought Fit For Real People, and I had trouble fitting the back. I had a bulge of fabric at the back of the waist, and didn't know how to fix it. Turned out I needed a sway back adjustment, but I moved on to something else. I had always intended to re-visit this pattern and finally have; I have so many purple skirt, and not many tops to go with them! The fabric I used is Cotton Lawn from Minerva Crafts, I used about 1.5 metres. And (this one was a revelation) moving the needle a little bit to one side when understitching, topstitching or hemming. That one so simple that I stopped in my tracks and thought, "Why didn't I think of that? What a numpty!!" It just made life more easy, it was simple to keep the understitching lined up with the edge of the foot, and the edge of the hem didn't pop up through the space in the foot! You really do learn something new every day! Also lowered the back neckline, but I can't remember by how much. It's a little bit too low now, but I can live with it. I'll raise it on the next one. I added two small darts at the back of the neck as it was a little bit wide, they are hidden under the collar. Photo of toile because it was impossible to see on the blouse. Because of the changes to the neckline, I had to re-draft the collar. I did this using the instructions on page 104 for Gertie's New Book For Better Sewing. The original collar is pointed at the front, I made mine more curved. I decided to alter the sleeves because I wanted puffy sleeves with a cuff. 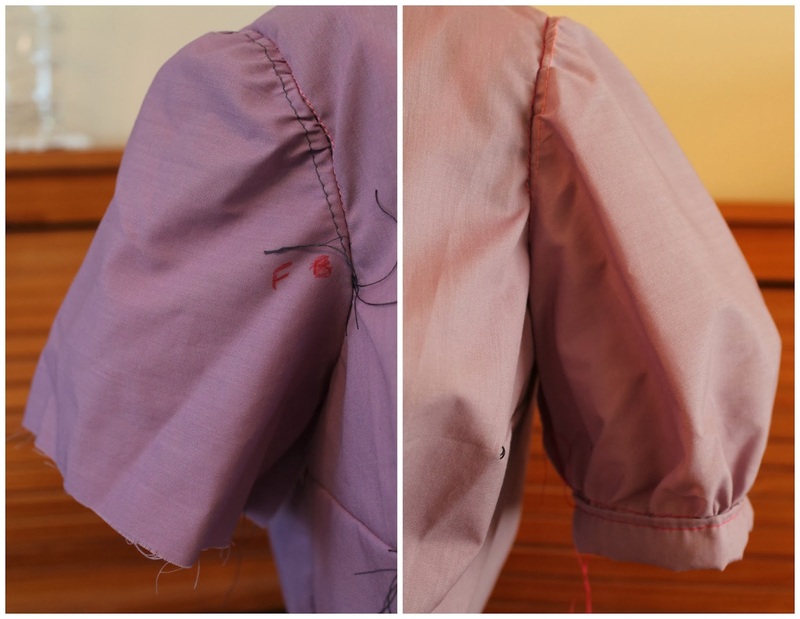 The photo below is my toile, the original sleeve is the one on the left, and my puffy sleeve is on the right. I came across this tutorial, and did as in the illustration at the top. I added 1 inch of length to my sleeve, and widened it by 4 inches overall. The cuff band is from the Deer and Doe Airelle Blouse, I just added a few centimetres in length, as it now sits further up my arm. I also altered the waist darts. The original darts are a V shape (unfortunately I didn't take a photo of them). 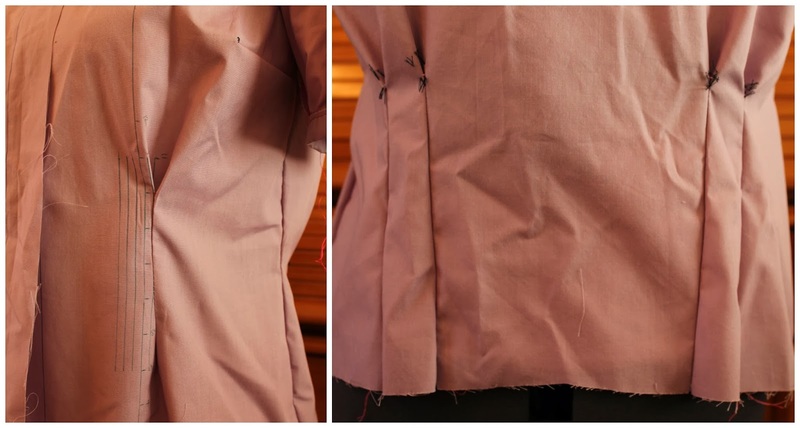 The point of the V starts at the hem, and it is sewed up into a release pleat under the bust - it's called a release pleat in the Craftsy class. I did this on my toile, but found there was a lot of fabric between the waist and under the bust. The release pleats reminded me of the pleats on the By Hand London Ann dress bodice, so I altered it to be more like the Anna pleats. 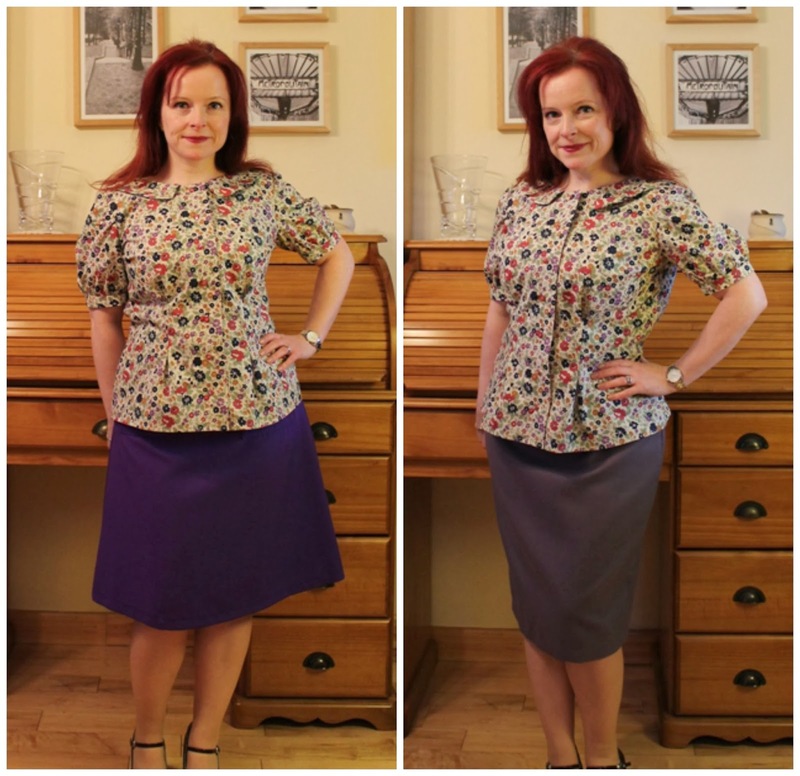 The photo on the left is my new pleat. On the right is the pleats on the back, just to give you an idea of what they look like. Apologies for the creases! The pen lines in the left photo are where I measured in from the centre front (please tell me I'm not the only person who scribbles all over their toiles!). My pleat is 4cm deep, tapering out slightly at the bottom. Below is a photo of it pressed flat from the inside. Hopefully you can see how it tapers out at the bottom. 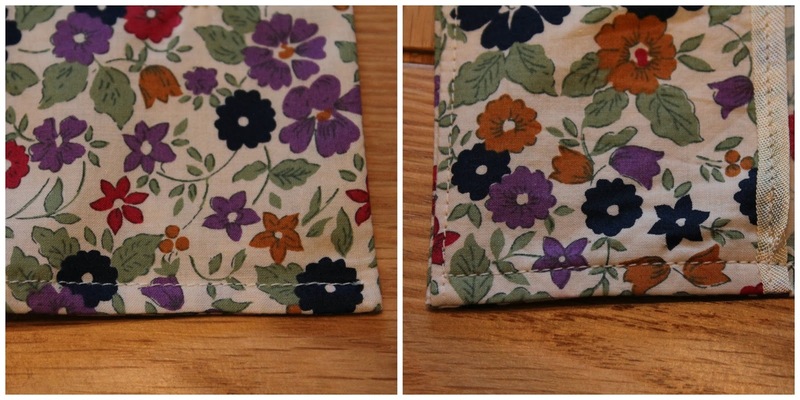 I finished the inside edges of the placket with some seam binding, and my automatic buttonhole feature behaved itself beautifully when I made the buttonholes. Yey! By the way, does anybody else play bobbin roulette when they're sewing? Here's how much thread I had left from a full bobbin! And here it is with my five (yes, five) purple skirts! 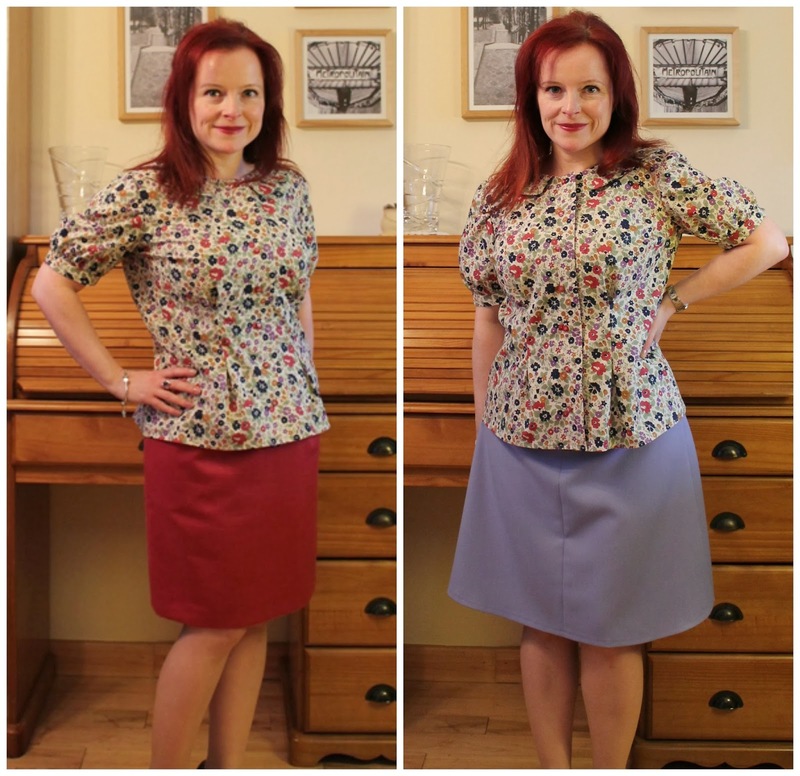 Although your eyes aren't deceiving you, the first skirt is red, it's Simplicity 2451. I made a few weeks ago from the not very good fabric I used for my second Elizalex. Unblogged Simplicity 2541, and Colette Patterns Ginger. The first skirt I made, and By Hand London Charlotte. 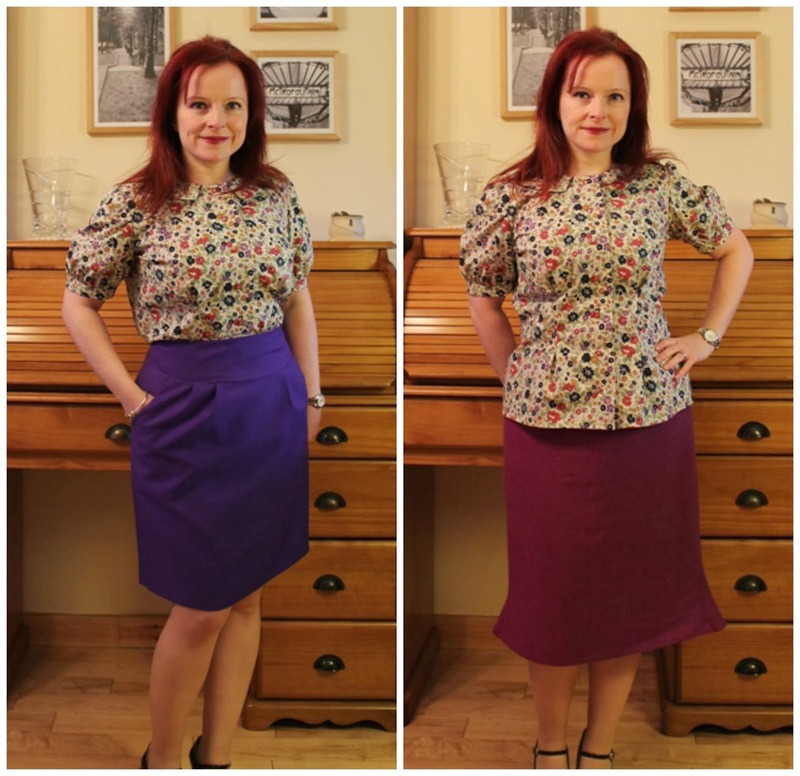 Simplicity 2541 and Flounce-a-lotte skirt. Thank you! I liked it with S2541 too, so hopefully that skirt will get worn more often! So cute! It matches so many items in your wardrobe! Thank you! I'm really pleased that it matched so many things. Lovely! It really does go well with purple. The fabric is gorgeous! Thank you! The fabric is great, it's lovely and soft and was great to work with. Such pretty fabric! I am seriously impressed by your collection of purple skirts too! Thank you! Yeah; it's a lot of purple skirts!! Thank you! I really should wear my Charlotte skirt more, but it's a bit tricky to walk in. This is such a lovely post - I love the puff sleeve details you have added, they really suit the style of the blouse. Thanks for doing such a lovely job with the fabric, it looks beautiful! Thank you! I was really pleased with how the sleeves turned out, and I loved this fabric, it was so easy to work with. This blouse is so lovely! And it's perfect for your wardrobe as I see all the combinations with the skirts! I love the fabric! I could wear this blouse right away! Well done! Thank you! I wore it to work on Friday, but I can't remember which skirt I wore it with! Gorgeous! Love the print and the incredible selection of skirts! Definitely think I'm going to take that class too. Thank you! I highly recommend the class, especially if you're a visual learner like me. Thank you! I'm already planning on making another one. What a fabulous blouse. It's lovely that you've made something that will help you get more use of of your 'orphan' skirts. Thank you! Orphan skirts; love that!! Great blouse! I have this course and still have not made it yet. I have no idea why because I simply love everybody's version of it. It seems to be universally flattering! Thank you! I really loved this class, it was so easy to follow, and I love how my blouse turned out. Thank you for your lovely comment, and the blog award! I am going to check it out right now! !